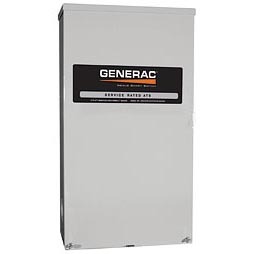 Generac RTSB200A3 Synergy Smart Switch, 200 Amp, 120/240V Single Phase – Synergy Smart Switches are designed for use exclusively with Generac Synergy 20kW generators. The 200 amp open transition switches are available in single phase in both service rated and non-service rated configurations. All Synergy Smart Switches are housed in an aluminum NEMA/UL Type 3R enclosure, with electrostatically applied and baked powder paint. The Heavy Duty Generac Contactor is a UL recognized device, designed for years of service. The control at the generator handles all the timing, sensing and exercising functions.